I didn't notice the project page before so moving post to here. -Mostly focused on the planning. Decided to use RPG Maker MV considering I bought it a few years ago but I never finished making a game in RPG Maker. Also unlike my last IGMC, I now have a full time job and other responsibilities so I only have a few hours per day to work on this jam and RPG Maker would make it much easier to start a project than unity. Title pending but decided game's battle system should be similar to card games like hearthstone, magic, and yugioh but in an rpg setting without cards. Even though I want a unique battle system I'm also inspired by undertale and yanderesim where the game can be completed without a single battle. Finally I decided on having a domino effect similar to yanderesim where I would have a finite number of students in a school who each will be at specific places at specific times. However the player's actions can change character schedules and there will be both combat and non combat options for achieving any goals. While I have thought of a story and 3 possible endings, They are still tentative to change. Planning for characters and routes are written down but are subject to change so I won't mention anything yet. First goal is to get the battle system working how I want with the help of some yanfly plugins. On the bright side, using some yanfly scripts I got mostly done with my ideal battle system. Its not that complication but I would still say its only about 65% of what I want it to be. Other than that, nothing much else to report. Didn't have much time to work on things today but I did manage to work more on my battle system. Its coming out more and more like I envisioned and i'd say its about 80% complete now but still have 2 major things to take care of. Hopefully I can finish up the battle system by the end of the week. Next week I want to flesh out character schedules. Short but sweet. Thats all for today. I was afraid I would have to cut some features out of the battle system but after watching some tutorials I was able to get a lot of things working. 0) Already implemented the ability to summon monsters. 1)Able to store and enemy id of target skill that I'm able to use l8r. 2)Able to assign my own variables to enemies and made my own notetags for parsing. 3)Thanks to the two above I'm able to have the enemies give/drop a specific item without killing them. Since I want a to have players do a pacifist run if they want, killing and enemy vs talking to them should yeild different rewards. 4) I have a mock conversation right now for proof of concept but thanks to some tutorials I watched, i'm going to make enemy specific conversations. Over the weekend I want these conversations to have branching dialogues options that affect rewards. I'm only allowing myself this week to work on the battle system so I'm happy that i'm starting to make some real progress. Thats all for now, tune back in tomorrow. I had to change things slightly but it came out really well. Instead of a capture system like in pokemon, depending on the current state of the enemy they will drop different items, which will summon them into battle. Certain items they drop even will summon them into battle with a unique states. I was able to make it so that I can provide specific requirements for an item to be dropped, right now I got it working with health percentages for proof of concept but I can make any evaluation. Also you can summon up to 5 creatures into battle at a time. If they are defeated, then you lose the item that summoned it. Oh and health and attack is displayed at all times similar to Hearthstone or Magic. Creatures are referred to as "2/3" such as that it has 2 atk and 3 health. There is no mana or tp in this game, yet spells or interceptors will use up the main characters turn. I wanted a battle system very similar to a card game with some pokemon-esc summoning creatures into battle. Convincing a creature to drop some summon items will result in no exp so your character won't level up. Killing a creature grants you exp and each level will teach the main character a new spell. 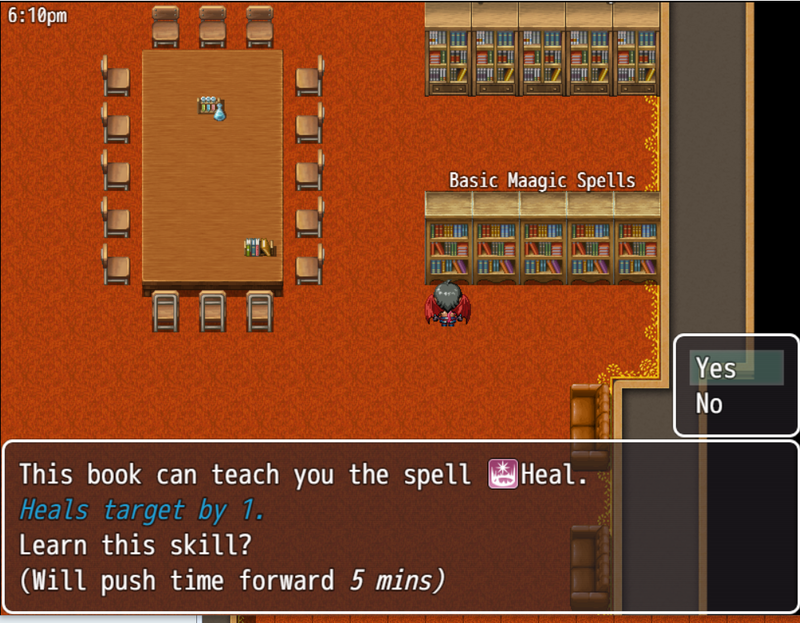 This way the player can choose to summon or only use spells or balance the mechanics. Next week, I need to start making schedules for my 20 characters (this number may increase or decrease) and build the school map to completion. Wish me luck and hope everything goes well with your own games! I got 2 important things done today. was able to set an event's location based on that time. With these 2 things now in, I can start setting up character schedules. Thanks for tuning in, Jtrev out! Decided to implement something simple today since I had such a limited time today to work on things. All actions in this game is going to push forward time, that includes anything from battles to reading a book. Also I want all choices and actions to feel meaningful so instead of a library with random flavor text. I decided a magic library should be able to teach you new spells. In exchange for time of course. I will have to balance what skills are learned by gaining levels vs those in the library, but for now, just glad I got this feature in. That's a neat idea. I'm interested to see how you balance it but, like you said, just the implementation is interesting enough for now. Went back to planning phase as I realized while I had certain ideas for events and locations, I hadn't fully mapped out the school yet. Which might be helpful for mapping out schedules. 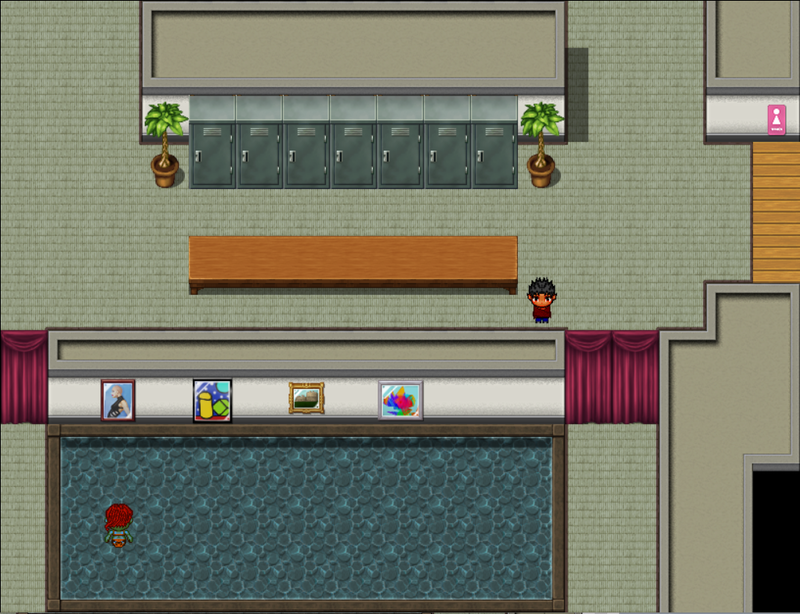 So today I fleshed out the design of the school and made maps for 2 more locations. Personally behind where I want to be but I think i'm still on time overall and can get this finished before the deadline. Finished making the maps, for my limited experience with rpg maker I don't think they look too bad but I definitely rushed some over others so I might change them a bit later. Also I found my old sprite sheets I made a few years ago when I tried to make an rpg maker game in the past. Some of the art might need to be touched up a bit but overall I think I can use a good amount of them. With all the maps created I now can start working on character schedules. Started working on scheduling. Mapped out the main antagaonist's schedule on paper and have made some progress eventing it. Should be able to finish their schedule by tomorrow. Once thats done I can implement more students. Lots of work finished today. 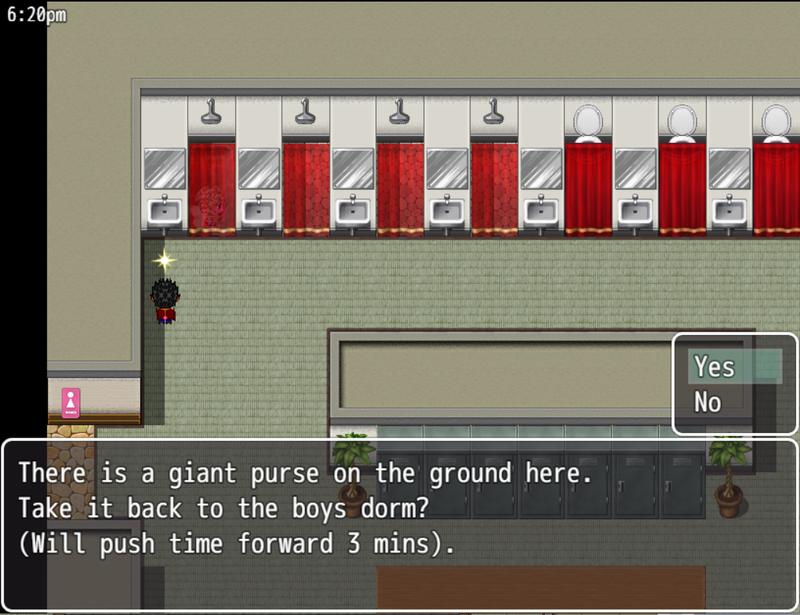 Added a few more optional events and optional battles to school, currently have 5 students with schedules. This doesn't really sound like a lot of work on paper but I'm happy I was able to get all this done. I want somewhere between 15-25 characters including students and teachers so I'll still be focusing on schedules and optional events for the time being. Though, by the end of the week I want at least two different endings to be available, if not more. In the past IGMCs I've been a part of I didn't think heavily on the hour time limit before with my game but this time I want to give as many options as possible but shorten the gameplay time down by having all actions cost time. This will allow me to easy make the game beatable in under an hour while also allowing other players to play through it multiple times and get different endings. In short, every player's experience with it will be slightly different since i'm even making certain enemies fight-able during specific time frames. Wish me luck, and have fun with your own games as well. Can't say i made anything new today or added any new mechanics, but I watched some tutorials and made a lot of existing mechanics more generic so I have less things to edit when copying events and reusing code. Honestly as more of a programmer than a designer, making events more streamlined seemed to be of higher importance to me. Decided to give myself a break and focus on playing some games. So in the last two days I only added one more student into the school with a schedule and made some minor fixes. Decided its better to take a break and come back with a fresh mind. My scope of the project was too big and my limited experience with rpg maker made me unaware of its limitations. Some things I thought would be easy turned out to be very troublesome and core things I designed that I tested working with actors was completely different for enemies. In short my original battle system was flawed and changes needed to be made. However the time feature and students still work as I want but I think now I should lower my desired number of students and focus more on multiple actions to be available at any given time. I have 5 students right now, so I'll be focusing on them first and them maybe add more. I would like at least one teacher, which time wise would be easy to implement, but I want to have more available actions with the player. Though I haven't posted much, work was done, but ultimately I had to go back to the drawing board and scrap some of my plans and change some things. Also with the time rapidly lowering, I think its fair to lower my scope and focus on the mechanics already in the game. If anyone actually read all my posts its easy to see that I lost some steam halfway through the game jam, not to mention I didn't post anything while I was celebrating the holiday. I had to make some major changes in these last few days and cut more than a few things I was still planning. Despite this, I can proudly say that i'm happy I was able to submit my game to the contest. Given a few more days, there are definitely things i'd want to tweak but overall i'm happy with how the game turned out. Ending with 12 students, 7 spirits, a fully stocked library of skills, some hidden Easter eggs, and 3 possible endings. I can say that i'm satisfied with the end result.